Bernadette Fox is notorious. To her Microsoft-guru husband, she's a fearlessly opinionated partner; to fellow private-school mothers in Seattle, she's a disgrace; to design mavens, she's a revolutionary architect, and to 15-year-old Bee, she is a best friend and, simply, Mom. Then Bernadette disappears. It began when Bee aced her report card and claimed her promised reward: a family trip to Antarctica. But Bernadette's intensifying allergy to Seattle—and people in general—has made her so agoraphobic that a virtual assistant in India now runs her most basic errands. A trip to the end of the earth is problematic. 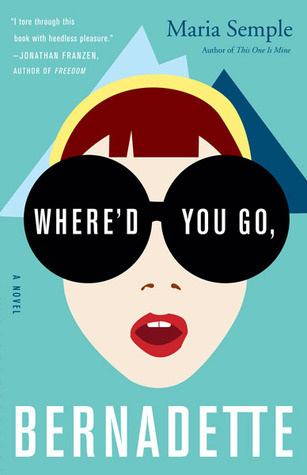 To find her mother, Bee compiles email messages, official documents, secret correspondence—creating a compulsively readable and touching novel about misplaced genius and a mother and daughter's role in an absurd world. This book is SO much fun. It reads as a simple, light-hearted story, but with these crazy characters Semple is saying so much about our society. There were points in this book where I was almost literally LOL. Many I was just smiling and shaking my head. For starters, who wouldn't like to outsource their daily chores to India? I kind of wish I had my own Manjula -- except minus how that ended up. I was literally having a conversation about neighbors and their plans while reading the whole scene with Audrey and Bernadette and the blackberries. The gem of this book is that the situations are all ones that we can relate to, and then they are taken to the extreme to show how silly they really are. "Mercedes parents"?! Lol! Drivers in Seattle?! That could be anywhere in the U.S.! The portrayal of Microsoft and TED Talks?! Hilarious! Because we all understand. Then, of course, there is the mystery of where Bernadette went. I never solve these things so I definitely didn't know until it was explained. I would definitely recommend this book to anyone living in these times, and I think I will start doing so. Go pick it up! You won't regret it. Background by Angie <3Nan. Powered by Blogger.